There’s more than one way to lead. Leadership can be customized to the individual. Some lead the old-fashioned way, from the top down; they give orders and others follow. Then there are servant leaders, those who lead through service to their teams. This might sound backwards, even counter to what leadership is, but the definition of leadership is broad enough to hold a multitude of approaches. Therefore, it’s best to know as much about those different techniques and use the ones that fit best with your organization, personal preference and project that you’re managing. Of course, one size doesn’t fit all, and it’s likely you’ll find yourself leading with an à la carte method, which is even more reason to know the full spectrum of leadership. So today, let’s take a look at one of the foundational types of leadership—transactional leadership. Transactional leadership is about supervision, organization and performance. It’s where leaders promote compliance from teams through rewards and punishments. Bureaucratic (Transactional): Leadership through normative rules, regulations, strict discipline and systematic control. Traditional (Feudal): Leadership over followers who believe in the legitimacy of governance, personal loyalty and faithfulness. Charismatic (Transformer): Leadership that is characterized by dedication, illumination and heroism, where followers have personal trust in leader’s charisma, vision and mission. 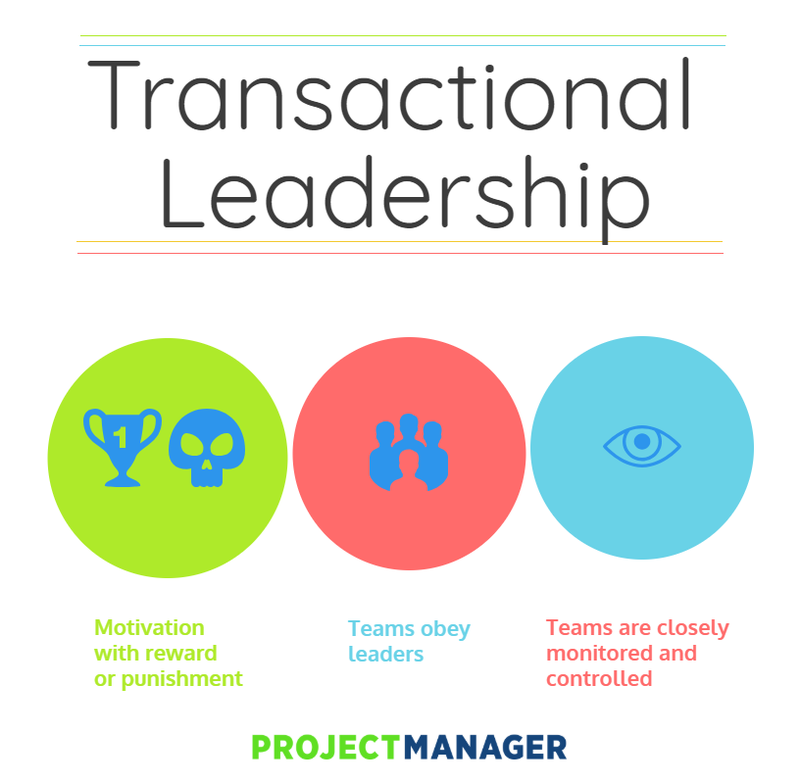 The transactional leader motivates teams mostly through appealing to their self-interest. Therefore, a transactional leader’s power is directly related to their formal authority in the organization. Teams obey their instructions. The motivation of teams is maintained through a system of rewards and punishments. Do what you’re told and you’re rewarded, but if your task is not completed or done as required, then there is a punishment. Contingent Rewards: Goals are linked to rewards. Expectations are clearly stated, resources provided and timelines agreed upon. SMART (specific, measurable, attainable, realistic and timely) goals are used. Active Management by Exception: Leaders are monitoring the work assigned, making sure that it doesn’t deviate from set goals and taking corrective action to prevent mistakes. Passive Management by Exception: Intervention occurs only when performance isn’t meeting expectations. Punishment can be used to respond to poor performance. Laissez-Faire: Teams have the opportunity to make decisions on their own, but with the leader abdicating it can cause a lack of direction. The transactional theory of leadership makes some assumptions. One, that employees are motivated by rewards and punishments. Also, this assumes that teams will obey the leader’s orders, and they’re not self-motivated. Therefore, teams must be closely monitored and controlled to get the work done. It can be said that transactional leadership overemphasizes short-term goals and deny the creativity of teams to generate their own useful ideas. However, this leadership style might be well-suited where organizational problems are simple and clearly defined. Transactional leaders are effective when working to increase inefficiencies, cutting costs and improving productivity. They are highly direction and action-oriented leaders, but their relationship with teams are more transitory than emotionally based. The relationship is based on money for compliance and effort. While transactional leadership is offering a clear employee motivation through achievable goals, structure and productivity and cost controls, there’s more nuance to the characteristics that make up this type of leader. Motivation is external, in that teams are rewarded for doing what they’re told and punished if they don’t. Therefore, transactional leaders are appealing to the team member’s self-interest, as they are personally rewarded or punished. Teamwork is not emphasized. Transactional leaders work in a management style that is strongly practical and realistic. They solve problems and think pragmatically. All realistic constraints and opportunities are taken into account when they’re making decisions. Change is not their friend. Transactional leaders prefer to work within the existing system. While change is a constant in a project, the mechanics in which they excel are highly structured and unchanged. They want things to stay as they are. They can be described as passive, in that they’re supportive of the status quo. They are top-down leaders, who believe that all decisions are up to them and must be followed. Therefore, there can be a lot of micromanaging from transactional leaders, as they are invested in things going as they planned for them. Related: Leadership vs Management, What’s the Difference? The corporate structure is important, and hierarchy is rigidly enforced. Problems are reported through the proper channels, as not following protocol is frowned upon. Transactional leadership isn’t for every organization. As in any management style there are advantages and disadvantages. While the advantages have been discussed, such as how it encourages productivity through a system of rewards and offers a clear structure with achievable goals, there are disadvantages. The most obvious disadvantage is that the motivation is based on reward, which is usually money. This is not always the best course of action in which to retain loyal team members, as they’re easily recruited by a larger dollar figure, which can lead to high employee turnover. It also is dismissive of other factors that motivate team members. For example, if they want to feel creatively part of the project. Then there’s the reward itself, which might not motivate the team. When the system works, it works well, but the fit must be right. Another disadvantage of transactional leadership is its rigidity. Leaders are on top, and their orders are expected to be followed without question or suffer the consequences. The transactional style is rigid and so is the leader, who is often unwilling to listen to other ideas, which can have catastrophic results. Because of this rigid structure, with a leader directing and teams following, there can be a problem of always blaming the team when goals aren’t met. While the team is responsible for meeting their assigned tasks, there are often factors at play which are beyond their control. If a leader isn’t supporting them by providing the needed resources, and then blames the team for not meeting expectations, trouble ensues. Finally, there can be an over-reliance on the leader in such management styles. For one, it puts the leader and the team in an adversary relationship. The leader can manipulate teams with rewards, so the reward becomes the object of the project and not its actual goals and objectives. So, is transactional leadership for you or do you prefer its opposite style, transformational leadership? Remember that one from the beginning of the post? That’s a leader who is proactive, brings new ideas to an organization and motivates by empowering teams to achieve higher goals inline with their values as a team, rather than reward-oriented individuals. Transactional leadership can handle small operational details quickly and keep teams productive. While a transformational style is more suited to strategic development. They can come up with ambitious goals and achieve them through vision and team-building. A wide variety of businesses use transactional leadership as a management style, from nursing to manufacturing. It works best in environments where there needs to be a clear leader, and everyone has a designated task to complete. Deadlines and progress can be easily monitored and reported on. But transformational leadership continues in popularity, especially in startup culture, as it encourages individual team members to strive to be better and work towards organizational goals by appealing to their values and ideals, rather than merely financial concerns. These leaders are engaged with teams throughout the project and team members respond to this attention and openness to their feedback by working hard as a team to achieve their goals. What style is right for you depends on the project and organization. There is no right or wrong, just different options. Understand your work environment and you’ll know which leadership style is the one to use for your project. Once you have a leadership style in place, you’re going to need the resources to get the project done right and on time. There’s a lot to track, from schedule to budget and resource management. You’ll also want to have a tool which gives your team a collaborative platform to keep everyone on the same page. ProjectManager.com is a cloud-based project management software that gives you and your team the real-time data they need to succeed. See how it can help you by taking this free 30-day trial today.